Among both academics and popular authors, the sixteenth century Protestant Reformation is one of the most widely studied and contested periods in world history. 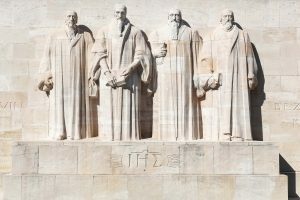 Early accounts of the Reformation often portrayed the period as either being saved by the unassailable paragons Luther and Calvin, or as dominated by those two flawed, inconsistent, and divisive devils. However, as a flood of evidence came to light supporting the many claims of widespread corruptions found among the period’s Catholic leadership, the scholarship shifted almost exclusively to favor the work of the Reformation’s leading men. The situation further changed in the mid-to-late 20th century when social historians began to undermine the role of individuals in shaping that, or any period, in world history. Among the most extreme in this camp, the idea became fashionable that Luther, Calvin, and others were simply retro-fitted figureheads that neatly symbolized the “complicated” popular demand for change in church and society. To that end, during the 1970s and 1980s, many German histories intentionally downplayed Luther or did not mention him at all. Calvin, on the other hand, was often portrayed as a cruel totalitarian leader over a Geneva that had an uncanny resemblance to Moscow and the Communist Soviet Union. This focus on social history was complemented by the work of psycho-historians, such as Erik Erikson in Young Man Luther, who outright challenged the sanity of leaders such as Luther Fortunately, the past couple of decades have seen these studies give way to more balanced and nuanced histories. No doubt, the occasional academic or popular account can still be found that deifies, demonizes, or outright discounts the Reformers. But, on the whole, scholars are distancing themselves from these extreme perspectives, and we are all the better for it. This recent historiographical shift has revealed a much more complex (and edifying) narrative of the Reformation that needs to be addressed more thoroughly by modern Protestants. Fortunately, this year the Protestant world finds itself celebrating the 500th anniversary of the Reformation. The renewed interest in and fresh appreciation for this rich heritage presents us, as heirs of the Reformation, with an occasion to earnestly reconsider the familiar stories we know about the 16th century reformers and the wide-ranging influence of their work. Celebrating the Reformation and Why it Still Matters Please Welcome New BTS President, Ike Reeder!